If at all you travel to Udupi, Mangalore or Kundapur, don’t miss out the beautiful beaches and the delicious mundakki upkari. Mundakki upkari is the most loved street food of Udupi, Mangalore, Kundapur region. There’s always a mundakki stall during the yakshagana nights, during car festivals or during any social gathering in these parts of coastal Karnataka. And there's always one stall on the beaches of Udupi, Mangalore, Kundapur region. The road side vendors set up tiny stalls to sell mundakki. But the smell of mundakki upkari travels far and wide. It entices you from miles apart. :-) That's how there's always a huge crowd surrounding a mundakki upkari stall. Mundakki upkari is the Kannada name for the simple yet flavourful, tasty puffed rice snack of Udupi, Mangalore, Kundapur region. This delicious snack is very light. You can munch on a whole bowl of mundakki and not feel full. Mundakki upkari is known by many names, it is called charbure upakari in Konkani, kurle pachadi in Tulu. Mandakki upakari, churmuri are Kannada names. In our house, we always have charbure upakari when my large family of 59 people gather for any occassion, be it a festival or a function at home or a visit to the beach. My mom and my aunties prepare it with great enthu and everybody just hogs on them, kids and elders equally. It's very easy to prepare mundakki upkari, it can be put together in 10 minutes. This recipe here is how mundakki upkari is prepared in coastal regions of Kundapur, Udupi and Mangalore. In a mixing bowl add in puffed rice, salt, red chilli powder, rasam powder and mix well. Add in coconut oil and mix well, such that the powders mix well with the puffed rice. 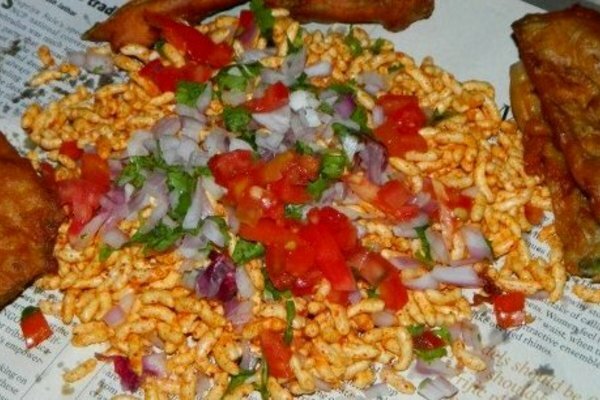 Add this spicy puffed rice onto a plate. Add finely chopped tomato, finely chopped onions, peeled, grated carrot, finely chopped fresh coriander, lemon juice on top and mix well. When the puffed rice is mixed with tomatoes and carrots it tends to get soft and soggy with time. It's nice to eat puffed rice only when its cripsy and crunchy. Garnish with grated mango if they are in season. What makes this simple snack tasty is a good rasam powder, especially the Brahmin tomato rasam powder you get in Kundapur, Udupi, Mangalore. If you don’t have a good rasam powder then use twice the amount of red chilli powder mentioned. This snack is delicious because of the fresh ingredients used and due to the perfect balance of spice and sourness in it. Some vendors add peeled, grated beetroot to mundakki upkari and that tastes great too! Bangalore churmuri is different from the above mentioned mundakki upkari. Find more Udupi, Mangalorean snack recipes here.